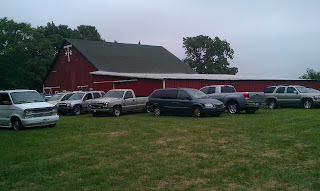 I attended an auction in Arcadia, IN last Saturday. It was on a large farm, surrounded by cornfields. Auction bliss! 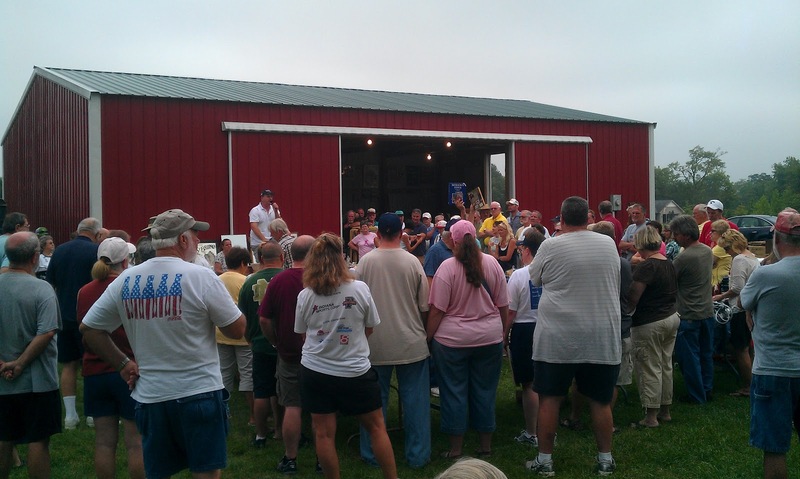 My favorite auctions are on-site in the middle of nowhere. It was a beautiful day, not too hot, and the auctioneers wasted no time. A glimpse of part of the crowd. Just wait... they'll be in my Christmas shop soon! to my green enamel collection. Fire King McDonald's promo cups. Cute canister set. I have so many already. And they are always ridiculously priced. donated all these to Goodwill. Autumn Harvest. Perfect for fall. Glasbake. I have the bread loaf sized pan in this pattern too. Finally, the same day I attended the auction in Arcadia, my mom and dad decided to stay local and attend garage sales. My mom is becoming quite the picker for me out there. She knows what I like. She went to an estate sale run by the son of the woman who had owned the goodies. Mom instantly recognized the Butterfly Gold Pyrex. And, I apologize for being out of order, but the cornflower blue FK casserole from above, was another purchase mom made at this estate sale. She recognized that pattern too. She asked how much, and the man said a quarter a piece. I hope you were all as shocked as I was, considering how much folks jack up prices on Pyrex these days. She saw one more bowl. She had never seen the pattern before, didn't know if it was anything special, and so she bought it too. For a quarter. A QUARTER! I have never seen a dots in the wild. Part of me wants to go back to this house and demand he find the remainder of the set! This bowl is absolutely perfect. Not a scratch. It's as if it was never used. For now, this bowl is a display keeper, even though I'm a green gal, and spring blossom is my usual keeper.